My friend and tech editor Lori and I have been working like crazy on the upcoming Sunflowers and Zinnia pattern. It should launch by noon on Friday. Had a bit of a snafu with my over 4 year old Mac Book Pro on Sunday - just when I was closing in on the finishing of the pattern. All of a sudden the screen went black. I couldn't revive it. To say panic ensued would be mild. Off I went to Brown Computer Solutions in Brattleboro this morning and somehow it was revived miraculously (at no charge - that place is really wonderful). They told me not to trust it though and it looks like I'm going to be in the market for a new Mac Book Pro shortly. Oh, how I hate to spend the money on it but my computer has become my life - crazy as that seems..... I've got a good back-up and will religiously back it up every day now, knowing this old thing's days are numbered. I hope I can make it to the new year on this one. Lori and I were talking about the PDF Download Pattern Collection that has been developing here on the blog and website. 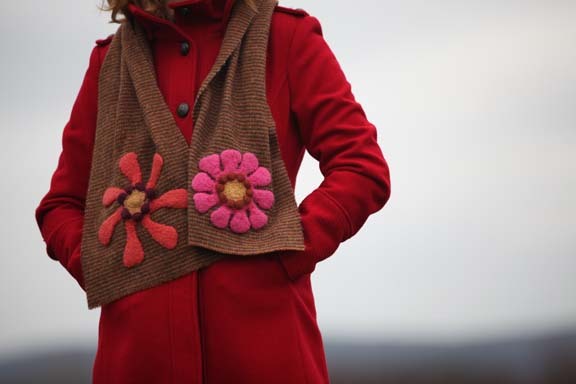 It has grown organically, depending on what I wanted to knit and design at any particular time. I didn't realize it but at least half the patterns are felted. Guess I like felting. Wondering about all of you. Do you still like to felt your knitting? Someone - don't remember who - told me felting was over. I'm not inclined to agree with that though. I just love the fabric that is produced when I felt wool - it is so thick and textural and gorgeous. I love it for home decorating and home products. I just finished a set of potholders for my Mom's birthday. I'll be giving them to her at Thanksgiving (late, as usual - her birthday is in October). These are potholders from my Swirly Twirly Pattern which is available on my website here and on Ravelry here. They are a really fun knit. Here they are before felting. Have you ever used wool potholders? I can't tell you how super fantabulous they are! They don't catch on fire pretty much ever - you have to leave them on top of a pot for a long time in order for that to happen. I will not lie - I have scorched them but sometimes I am a careless cook! The Swirly Twirly Potholders are nice and thick and it's pretty impossible to burn yourself. I only use wool potholders - never cotton. If you have a Christmas gift to knit for someone who loves to cook, this is a great pattern. I hand-stitched two different color flowers to the bottom of a piece of wool tweed fabric from my fabric stash that I ripped into scarf size. I love how this photo came out. It was a cloudy, grey day and I used the sky as a backdrop for Celia. Pop back everyday this week for another preview - that is if my computer keeps working! The pattern will be live by noon on Friday. 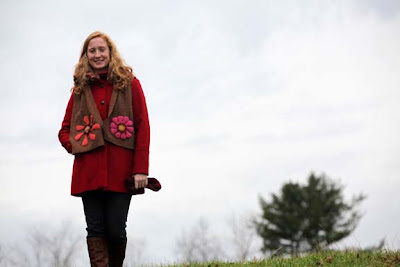 Felting isn't over! I'm in the process of knitting several pairs of Duffers (slippers), clogs, and a cat basket for Christmas gifts! Thought about you this morning, Kristin, as a put my favorite hat on for the first time this season. 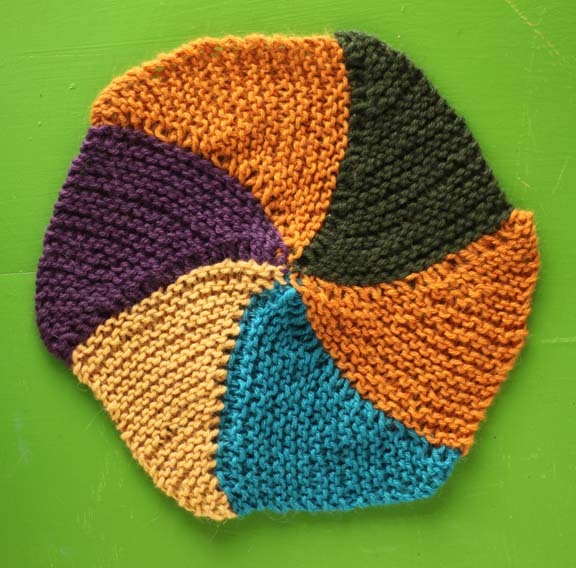 It's your pattern, the Taffy Stripes Hat. I've made several (in fact my first one is the feature photo for the pattern on Ravelry). I hope you are warm as toast this cold November day! Kristin! I still love felting and have made a set of your swirly twirly coasters - nothing better for a glass with condensation all over it! 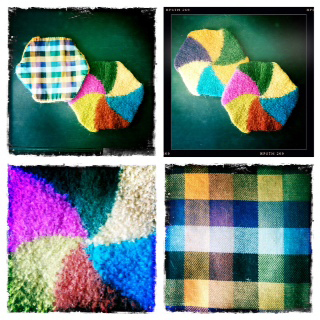 FELTING is a CLASSIC, *not* a "TREND"! It will always be around! 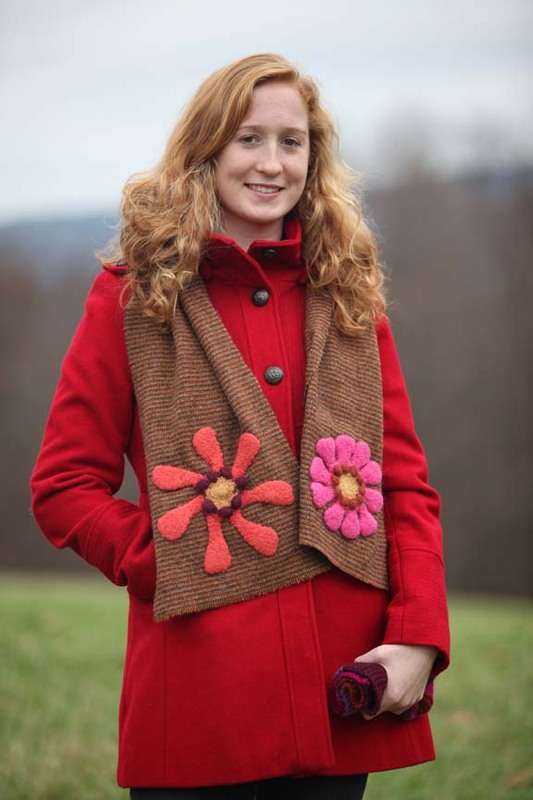 BTW, Celia has a promising career as a Needlecraft Model. She looks GREAT!! Gorgeous scarf! I love that you have a fabric stash. It's perfect for gray winter days. I l.o.v.e. felting; love the texture! Never ever get tired of it! I have never felted (*gasp*! ), but *am* tempted by your flowers. You may get me felting (and stitching) yet!! Re. the 4 year old macbook pro... I have one of the same vintage, and have to acknowledge that the disk might go at any time. But, re. the screen blanking out -- can you take it to an Apple Genius Bar, or did the folks in Brattleboro run the NVIDIA graphic card test? Some MBPs of that generation had faulty NVIDIA graphic cards, which are replaced by Apple for free. Just a thought. If someone enjoys doing something who cares if it's a trend or not? Felting has been around forever and will be around forever again. We should all do what we enjoy in the fiber world and not listen to people who are on to the next thing. I did see a copy of Living Craft at JoAnn Fabrics today. Even the new pups were included!! I hope you can find them in the snow.